UPDATE: JUN 28, 2013 “The Story of ProfitClicking” is likely the final word on what went wrong and why ProfitClicking never lived up to the “indefinitely sustainable” expectations for which Mr. Mann’s other programs (JustBeenPaid and ClickPaid) have been justifiably acclaimed. UPDATE: JUN 22, 2013 Today, Tame Bear received a “Very Time-Sensitive Message From Frederick Mann” apparently sent to all former ProfitClicking members. In this email message, Mr. Mann invites members of ProfitClicking/AdClickXpress to join his successor program to JustBeenPaid. This new program is called “ClickPaid” and is an authentic implementation of his “indefinitely sustainable” advertising-and-earning program but with step-by-step setup of the first pay-it-forward Ad Package, and daily 2% earnings paid within minutes of signup. The Tame Bear “No Money Down” approach to both of these programs — AdClickXpress and ClickPaid — is to get in, get your free $10 to begin earning, pay none of your own money into the program ever, begin using your earnings to purchase additional Ad Packages and upgrades, and eventually withdraw money to your preferred payment processor as it reaches threshold payout levels. Tame Bear’s take: These sites are useful for presenting your ad pages to an audience of millions of ClickPaid and AdClickXpress members. They are essentially Traffic Exchanges, which also offer the potential to pay a residual income. UPDATE: JUN 18, 2013 After a very rocky few months in which ProfitClicking attempted to re-engineer the advertising-and-earnings formula, the owners have apparently given up trying to fix what was seriously broken. The company raked back all pending withdrawal requests, further alienating their already distrustful membership. And then virtually overnight the site was reconfigured, rebranded, and relaunched — this time under the name “AdClickXpress.” This looks like a faithful implementation of the original Frederick Mann “JustBeenPaid” formula, and so far appears to be paying sales rebates reliably every day. UPDATE: MAR 12, 2013 ProfitClicking was never functioning as smoothly as JustBeen Paid had operated. The benchmark “Daily Sales Rebates” were rarely paid on a daily basis. Instead, they accrued over several days and were deposited into member accounts as lump sums, complicating the timely purchasing of additional Ad Packages. By November it was clear ProfitClicking was having trouble paying withdrawal requests, leading Tame Bear to advise referrals to suspend promotion of this unreliable advertising-and-earnings program. Can you name a web destination that has lept from complete obscurity into “Top 500” Alexa ranking in just two months? 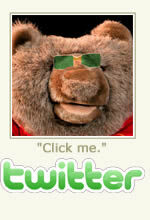 It goes by the name “ProfitClicking” — which as names go, seems a pretty uninspiring moniker — at least to this Bear. Nevertheless, the program itself is fascinating, and we’ll see why in just a moment. But first let’s examine where this company came from, and how it gained that fantastic Alexa ranking so quickly. The ProfitClicking program has actually been in existence since early 2010, operating under a different name, a name you may or may not be familiar with, depending on the circles you run in. If you read my blog regularly you will have heard of this company. It went by the name of “JustBeenPaid.” (Another lackluster name, in my opinion, but clearly names aren’t everything.) The JustBeenPaid program was developed by mathematician and business tycoon Frederick Mann. Mann is an alleged genius, and his JustBeenPaid program proved to be very popular among people looking for a way to make money on the internet. In just a little over two years JustBeenPaid attracted more than a million members, and top earners in the program have reportedly raked in close to $1million usd. By late summer of 2012, JustBeenPaid was struggling under it’s own success. The site’s servers were clearly not up to the task of managing the unanticipated success of a million active members, and the program was unable to keep up with exponential growth. The main feature of the program was “2% daily earnings” paid every day. With over a million members, and a very deep and complex heirarchy of referrals, positions, and matrix spots, JustBeenPaid’s database backend was falling further and further behind in its ability to perform all the operations necessary to calculate and record daily payments. The prospect of updating the server infrastructure was daunting, and in the end Mann and company opted to sell their program to other private investors rather than make the necessary upgrades themselves. The sale took place in late August 2012, and the earnings program was paused for over a month while web site rebranding and infrastructure rebuilding were underway. During that time existing members continued to log into the site and familiarize themselves with the program’s newly designed “Dashboard” as new features were introduced almost daily. And just a few weeks ago ProfitClicking began making it’s famed “2% daily earnings” payments once again, just as it had under the previous name, JustBeenPaid. Only now it was operating on much faster servers capable of managing future growth, and with a beautiful new web site that presented the various parts of the program more clearly and simply for newly arriving members. Some have classified ProfitClicking as a “high yield investment program” (HYIP) because it pays a flat rate of up to 2% daily on any money paid in. That means that if you “invest” $10 then about 90 days later you will have $15. It’s those daily payments accumulating in member accounts each day that makes the ProfitClicking program so attractive. Seeing that you are accumulating even small amounts of money in your account — earning something every day — provides a lot of satisfaction. In addition, the company offers a “Pay-It-Forward” initial $10 to start with, so new members can purchase their first Ad Package essentially for free. That $10 is returned to the company after 90 days, but in the meantime you’ve earned enough in daily payments to reinvest your earnings by buying a second $10 Ad Package. By joining ProfitClicking and participating in the Advertising program, you begin earning a steady income with no money down. None of your own money is ever at risk. And by continually reinvesting your earnings by purchasing additional Ad Packages, you can make more and more money over time. Turns out ProfitClicking is a way to make a lot of money. Look at month 12 — you can see that your monthly earnings will be just $40. But skip down to month 24 to see how it has grown. And by years 3 and 4 those daily earnings have become a major income stream. If you’d rather not wait that long, you can use your own money to purchase as many Ad Packages as you like, and receive the rebate daily earnings each month. As an example, say you want to generate a modest monthly income of $2,120. Look for that amount in the “Net Income/Month” column. Then read across to the “# of Active APs” column — 423. That’s how many Ad Packages you would need to purchase in order to receive a monthly rebate of $2,120. At $10 per Ad Package, you’ll need to purchase $4,230 worth of Ad Packages to earn your $2,120 per month. And keep in mind that these Ad Packages expire in 90 days and pay no further rebates after that. So in order to maintain this level of income, you’ll need to buy another $4,230 in Ad Packs every three months. You do the math and you’ll see your actual real monthly income is only $710. If you want to receive an actual $2,120 monthly income from ProfitClicking, then you’ll need to triple the amount of money you put in every three months. So you’ll pay more like $12,700 to buy 1,270 Ad Packs and receive $6,350 in rebates each month, for a net actual income stream of $2,120. If you have $12,700 in cash just laying around, then sure — give it a whirl. If you keep investing that amount in the program you’ll make $76,200 in a year on an annual investment of $50,800, for a net real annual return of $25,400. Not too shabby. As a business owner I am more interested in using the Ad Packs and the Traffic Exchange to advertise my own business to over a million ProfitClicking members, to attract new customers, and sell more of my own products and services. I’ll keep reinvesting that original pay-it-forward $10 so I can get my advertising for free and benefit from a growing stream of rebate earnings on the backside. ProfitClicking is an easy way to do that. There are currently four other ways to earn income from ProfitClicking — but this article is already running long so I’ll cover those additional income streams in another post. Watch for that update in the “Related Stories” section below, or Subscribe to the Tame Bear Weblog for an email notification when it comes out. And if you think you would like to become a member of ProfitClicking, you can click that big signup button below. It’s free — get your pay-it-forward $10, buy your first Ad Pack, and start earning. And since I’ll be your direct referer, you can pick my brain all you want to understand everything there is to know about this fascinating program. I’m having a blast with it, I’m sure you will too. What is "Just Been Paid" ?